Best-selling and International Prize for Arabic Fiction-shortlisted Egyptian novelist Ahmed Mourad was recently at the Emirates Airline Festival of Literature, where he spoke with Mohga Hassib for ArabLit. Mohga Hassib: This is not your first time at the Emirates Airline Festival of Literature (EAFOL), how does it feel to come back again this year? What’s different about this event from others you attend in the region and internationally? 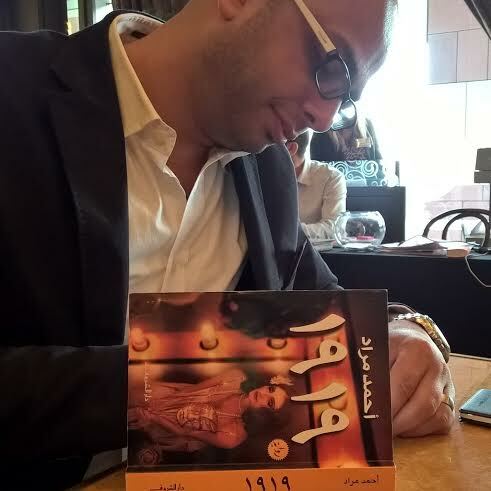 Mourad signing copies of 1919. Photo credit: Mohga Hassib. The noteworthy thing is … there is a process of planting culture, making reading a habit — not a hobby — and this in my opinion is something very important. Every year I attend at the festival I see a jump, which makes me delighted. As I walk, I witness schools and generations coming to have a look at the texts. This is something that didn’t happen 10 years ago — I find it fascinating. This is multiplied in Egypt. I recall, in 2007, when I started writing Vertigo, there was no such thing as a “best seller,” or the idea of purchasing a book as a gift. This is now a culture and a habit. MH: In 1919, why did you move away from writing contemporary thrillers? Do you feel the desire to regularly change genres, periods? AM: It is not a regular thing for me. Writing is like having a car — if you have it, you can move anywhere. I don’t take on a specific genre and consider myself Agatha Christie. I don’t write detective stories. I wrote Vertigo and Diamond Dust when the country needed to hear something about the regime and that was falling apart. I went back in time, in Diamond Dust, to the fifties and wrote about Mohamed Naguib and what happened to the country during that time. After the revolution [Jan 25], I felt that I needed to veer away from politics and open a different door. I began to turn to the psychological thriller and the search within the human self, which is more knotty. I discovered that humans don’t know themselves, and the human being says what he does not mean. So the novel started to formulate in the psychological form, and I embedded metaphysics and science until I finished it. It is absurd to write about the revolutions and their grand events directly after they take place. Naguib Mahfouz, for example, ceased writing for seven years after the 1952 revolution. The irony that I noticed after the release of 1919 is that after all these years, Mahfouz has written about the 1919 revolution as well. When Mahfouz decided to resume writing, he wrote about the past to make sense of his present revolution. I could not write about what was happening in the current revolution nor attempt to grasp it with all the changes that were taking place every day, but what I could do was bring a similar experience from our history and project on it or find the similarities, which was what happened with writing 1919. MH: Was the parallel between your writing 1919 and Naguib Mahfouz’s resumption of writing about the 1919 revolution a mere chance, or did you follow his footsteps? AM: Not really, there was no intention to follow Mahfouz. My primary intention was to write an engaging novel that shows us a history that we didn’t know and actually disliked reading about it in high school. It was a challenge for me make my generation read about this revolution [in a fun way, which was my goal], learning about Egyptian heroes whom were forgotten, such as Ahmed Kira, Dawlat Fahmy, Abdel Kader — understanding the character of Nazly before she turned into a monster. While I was reading and writing about history, I started finding all the parallels [between the 2011 and 1919 revolutions]. After I was done writing and released the novel, I was surprised to see that this is what Mahfouz felt; that he could not discuss his present because it was difficult to get a comprehensive picture of it. Taking a trip back in time to see an experience that was complete and understood was very thrilling. MH: How do you start a work? Do you begin with a character, a plot, a time…? When I find that there is little found in my interest, I get very heated to start researching its sources. When I find that the Egyptian or Arab market lacks this topic, I take the project on as an obsession that I will not get rid of unless I write about it. That’s how everything starts, then it is followed by the search, building characters, the plot, and then the course of action; how will a person go through and come out of this experience. In the end, I have to love what I am doing. MH: Would you be interested in writing a pure romance, or any other genre? Is anything else tempting you? AM: I can write about anything — if I love romance will write about it. Also, there is always a line of romance in my novels, love is something that the human being cannot get away from. However, I believe in something bigger than the idea of the genre. I am not occupied with the genre as much as the idea of “life” that gets embodied in the novel. In 1919, for example, the hero is in search of a patriotic duty at the same time he is in love, which is in conflict with his path — should he love and keep going or pursue his mission. Romance intersects with life, thrillers, suspense. What is important is having a novel that encompasses life, having a wider perspective, and this is what I feel the need to accomplish. MH: What are you reading at the moment? Did you get a chance to read any of the nominated texts for this year’s IPAF? AM: I bought all the books that were nominated for the Arabic Booker, but I have my research books for writing my next book. What I currently have on me upstairs is Shakhsiyyat Hayya Min al-Aghany [Living Characters from the Songs] for Mohamed al-Mansi Qandil. I read Lahza Tarikh [A Moment of History] by him. I also have the new novel al-Asyad [The Masters] by Hassan Kamal. These are what I have for leisure, the others are research texts for new topics. MH: Do you have a target of an average number of texts that you finish reading? AM: Not really, but what is important is finishing the texts that are important for my writing, and when I am exhausted from that information, I resort to free reading to disconnect and see something new. My target is reading in all of my free time; I have a book in the bathroom, one in the car, a PDF text on my phone, an e-book. I have to fill my free time. MH: After having had two of your works adapted to the screen, have your thoughts changed about the relationship between novels and cinema? What have you learned in the process? Is there advice you would give to writers who might be having their work adapted, or might want to? AM: What I know is that there is a writer who can adapt his own work and a writer who cannot. This is not due to a certain inability, because Mahfouz himself did not do that — I allude to him because he is the best of the best. Some writers like to compete with themselves, and others feel very connected to their texts and cannot distance themselves from their work. I resort to disconnecting from my work; like removing the USB cable, and forget that I wrote this text, then start competing with it. I don’t compete with it to break it apart but to create something exactly like it and preserve it while maintaining the cinematic criteria. In The Blue Elephant, I severed the connection and examined the text as an unsacred text that could be changed and renewed to find what fits the screen best. The reading audience, which represents two percent of the Egyptian society, is not the same as the cinema audience, which represents 35-40 percent of the Egyptian people. I need to be aware of the required criteria [for adaptation], and I need to view the text as something that is not sacred, susceptible to criticism — change and tweaking to fit the cinema. This requires courage and some literary slyness. One must examine the text and have a conversation with it. Bargain. There are an immense number of production companies in the market. There has been a movement toward purchasing the rights to a lot of the novels after the adaptation of The Blue Elephant. This could lead to some mistakes; the person selling the rights would be concerned with the money more than anything else and end up selling the novel at a very cheap price — some sell at 5,000 or 10,000 EGP just because they dream to see it on the big screen. I always say that some adaptations dim the text and other bring it to light. If you look at some of the adaptations done in the fifties based on Ihsan Abdul Quddus and Naguib Mahfouz, we see that some works made their texts immortal and others ruined it. In this day and age we need to: 1) Examine the producer of the work and what will the adaptation look like. 2) The novel does not need to be adapted in order to become memorable; some novels are beautiful but do not qualify for adaptation. Don’t push to get your work adapted, because if it fails, it will destroy the texts on the library shelves; no one will read them, and the work will not be get immortalized, it will become a joke. This happened to some works that I won’t mention their names. Know where your work is going, don’t look at the financials of it. Also, you might not be the best person to write the adaptation. If someone else can write it better, give it to them. I always look at my work when it is headed in the direction of the cinema adaptation as if I am sending my son to school. I want the best school, teacher, and transportation for my child. MH: When can we expect your next release? Any hints? AM: I never discuss any of my upcoming works. People know about the new release when the cover is released a week in advance. I do not like to say what I am going to do, because I do not like to rush myself. I also do not like to promise people things so that there aren’t high expectations. AM: I come from the school of doing my own research. I met someone very important in keeping documents in Egypt: Mr. Mowafaq Bayoumy. He has documents and newspapers at his house that go back to year 1916-20 that I can utilize. I could hire someone to do my research for me, but sometimes when I am searching for something, I encounter something better [than what I was looking for]. A hired person would not be able to detect that, because he would be looking for a particular brand of cigarettes being sold, yet there might be another product that was being sold that no one would think of. It is okay to have someone to do the research for you, but after exerting the effort and releasing the novel, the novelist will have written within himself 1000 novels from the experience he will have gained. It’s as though he had taken a course. I order to write this  I have encountered many stories that I didn’t include but were very useful to me. For the example; the texts of Salah Eissa where he discusses al-Brinsisa Wa al-Afandy [The Princess and The Effendi], Ma‘sah Madam Fahmy [The Tragedy of Madam Fahmy], and others about Rayya wa Sakinah; these are all in the era I tackled in my novel. I benefitted immensely from these readings and only inserted a few footnotes in the novel, yet I have so much [information] inside me. If I ask someone to find certain information for me, the process of gaining experience and the joy of knowledge will fade. Mohga Hassib did her graduate work at the English and Comparative Literature department of the American University in Cairo and taught academic writing at Misr International University. She has also been president and vice president of the AUC’s literature club.